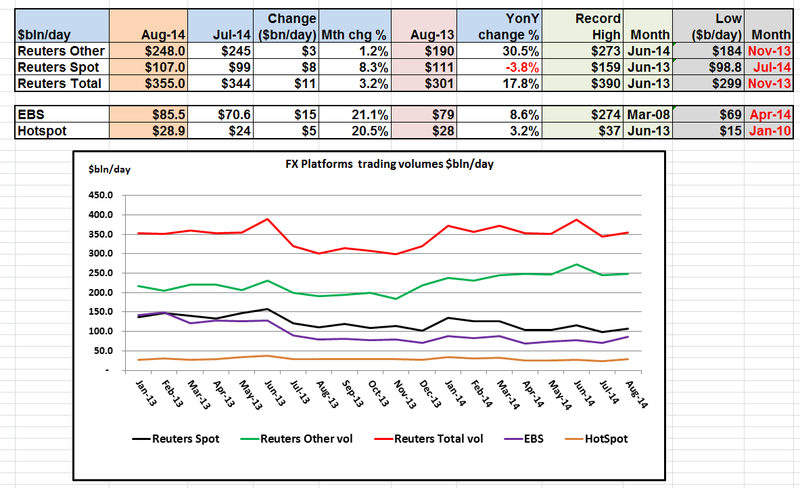 All the major FX platforms reported increased volume figures for August, with EBS leading the pack with a healthy 21.1% rise to $85.5bn/day and some 8.6% up on a year ago, with Thomson Reuters delivering a more modest 3.2% overall gain and Reuters FX spot with a 8.3% gain after the multi-year lows in July, although still down -3.8% compared to a year ago. This rise in FX volumes is also reflected in CLS settlement system which reported a 4% rise in the value of trades submitted to their platform at $4,900bln/day up from $4,710bln/day in July, although still up 9.1% on a year ago, with the number of trades submitted for clearing up 11.9%, although still some -5.3% down on a year ago. 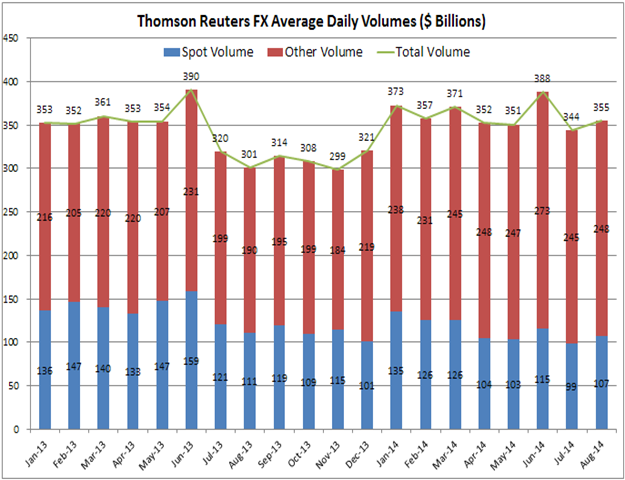 As previously mentioned, Thomson Reuters has now changed their reporting methodology, reporting aggregated volume for Reuters Matching, FXall and the Thomson Reuters SEF. 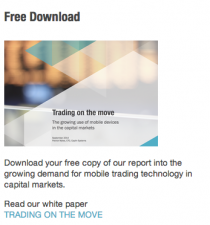 Only splitting out volumes for FX spot and aggregating all other products covering: forwards, swaps, options and non-deliverable forwards traded on those platforms. FXall volumes shown in previous months post here. Reuters total: $355bln/day in Aug, up 3.2% on July, and 17.8% up compared to Aug 13 level of $301bln/day. Reuters Other: $248bln/day in Aug, up 1.2% on July, and a healthy 30.5% up compared to Aug 13 level of $190bln/day. Reuters Spot: $107bln/day in Aug, up 8.3% on July, although down -3.8% compared to Aug 13 level of $111.2bln/day. EBS: $85.5bln/day in Aug, up 21.1% on July, and up 8.6% compared to Aug 13 level of $79bln/day. Hotspot: $28.9bln/day in Aug, up 20.5% on July, and up 3.2% compared to Aug 13 level of $28bln/day. Data from CLS Settlement system confirms the rebound, with volume of trades submitted to the system in Aug up 4% to $4,900bln/day, and the number of transactions submitted up 11.9%.